Atletico San Luis players celebrate the the Mexican second division title. Maradona watched from the stands due to a suspension and a video on social media showed the former Argentina manager losing his temper after being shouted at by rival supporters as he made his way across the VIP area. "Come here! I want him to tell me that to my face. I want you to tell me to my face," Maradona yelled, in quotes reported by ESPN Deportes, while being restrained by security staff. Taking a narrow 1-0 lead from the first leg, Dorados knew they needed to avoid defeat to take the title, and they took the lead on 32 minutes through Jorge Cordoba. 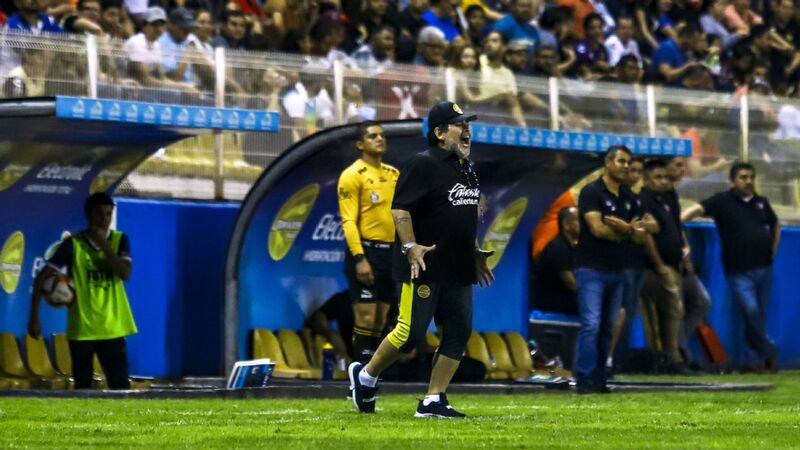 Diego Maradona watches on from the stands Dorados are beaten by Atletico San Luis. However, Nicolas Ibranez equalised for San Luis in first half stoppage time. Edson Rivera restored Dorados' lead on 56 minutes, but the hosts were level again 11 minutes later when Diego Barbosa put through his own net. Ian Gonzalez sent the match to extra-time when he put San Luis ahead for the first time in the tie 15 minutes from the end of normal time. Leandro Torres scored the game's final goal 13 minutes into extra-time to hand San Luis the title with a 4-2 win on the night.